Creating a landscape that looks great and functions well is about getting expert landscapers like us to design and plan these outdoor spaces. We take care to create a well-balanced landscape that will also be sustainable and healthy. In addition to all the masonry and softscaping elements, we focus on designing and installing the right kind of yard irrigation features. 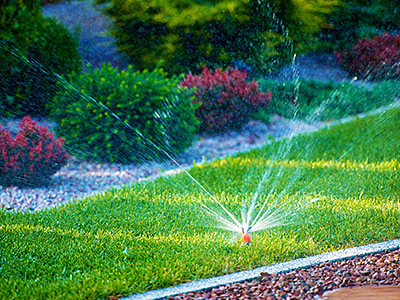 The plantings and lawns need the right amount of water to survive and only a properly-planned landscape irrigation system will help ensure that. We at Emerald Creek Landscapes, LLC are a well-established company in the landscaping field and have been serving customers in Ringgold, East Brainerd, and Fort Oglethorpe. Our experts have successfully completed a large number of irrigation design and installation projects across East Ridge, Dalton, Chattanooga and Red Bank as well. We have also catered to customers in Middle Valley, Cleveland, Soddy-Daisy, Calhoun and the surrounding areas and created beautiful hardscaping elements on their properties. Most of our irrigation system installation projects are part and parcel of landscape design and installations; but if you find that the plants or lawns on your property aren’t getting the amount of water they need, or if you notice excessive amounts of water in the lawn spaces, this could be an indication of a poorly-planned irrigation system. In these situations, its best to get these features replaced with a properly designed system. We have the expertise to handle projects of any scale and complexity and make sure that the best materials and workmanship are used in the work. Automatic Sprinklers - These are one of the most convenient ways of watering lawn spaces. The systems can be set to specific watering schedules so the grass gets the amount of water it needs, at the right intervals. Once these are installed and the timers set, you don’t have to worry about manually operating them every day. We can also connect rain sensors to these systems as these will regulate the working based on the rain conditions. Drip Irrigation - We can also install drip irrigation systems across various areas of the landscape. These are a network of hoses and emitters that deposit water at the root of the plants. This helps conserve water without compromising in the amount of water the plants get. In addition, we can also install soaker hoses that help in watering the plantings located in the more remote areas of a larger landscape. We ensure the job is completed professionally, efficiently and to your 100% satisfaction. With the vast experience and expertise we have developed over the years, we know what it takes to provide excellent solutions at very competitive irrigation installation cost. For any more information on our services or to discuss your project details, feel free to call Emerald Creek Landscapes, LLC at 423-593-5443. You can also send us your queries and project details via this online form.